On August18 , 2016, Georgia Aquarium staff members traveled to Key Largo, Florida, to participate in the annual coral spawning. The trip was in cooperation with the Coral Restoration Foundation, a nonprofit organization dedicated to the conservation and preservation of the ocean’s coral reefs, as well as other conservation organizations such as the Akron Zoo, California Academy of Sciences, The Florida Aquarium, SeaWorld, SEZARC, the Smithsonian, and the University of Florida. Endangered coral planula were brought back to Georgia Aquarium for the very first time by team members Steve Hartter, senior aquarist, and Kim Stone, curator. 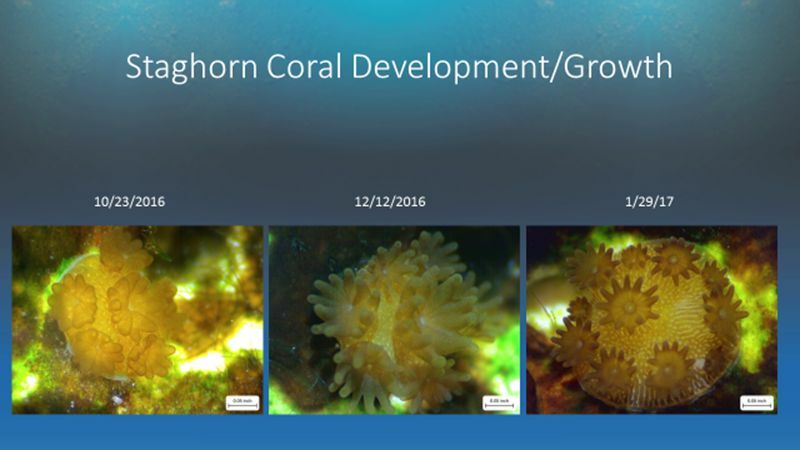 The collection, development and arrival timeline for these “coral babies” happened all in less than five days, and Georgia Aquarium is the only facility that participated in the 2016 spawning event to have a living coral baby. Creating the different settling environments was important because a variety of options were tested to better understand settlement preferences for future research. Once placed into the different environments, the coral began to settle and form a primary polyp, meaning they were starting to attach to a sedentary object. The corals were examined regularly under a microscope to make sure they were growing and thriving. Continued research and conservation efforts will help researchers find a way to help coral populations thrive in their changing environment. Kim Stone, curator of fish and invertebrates at Georgia Aquarium, has been working with the Coral Restoration Foundation project since 2010 and has 20 years of experience working in public aquariums with a focus on coral research for about 10 years. Q: Kim, in your own words, how would you explain the process in caring for the coral babies? The process with caring for staghorn coral planula is a very delicate process, and one that we are still learning the best techniques for. We have been able to take our knowledge in working with Elkhorn coral, which is another endangered species of Acropora found in the Caribbean, and apply those techniques as a starting point. We worked closely with a collaborative group of other zoos and aquariums along with the Coral Restoration Foundation, and we were able to share all of our experiences and work together to flush out the best technique that will yield that highest survivorship for the corals. Q: Was the experience more difficult or less difficult than you thought it would be? The entire experience wasn’t necessarily more or less difficult than we thought it would be. It’s always going to be an experience that we can learn from and improve on for future coral spawning efforts. Q: For upcoming coral baby retrieval trips, do you plan on sticking to the one method that kept this one coral alive, or have a variety of environments like the 2016 trip? We just attended a workshop group discussion with all of the collaborative facilities that were involved, and will be attending this year as well. We have some ideas for changes we would like to implement for the upcoming 2017 coral spawning trip. I’ll be able to provide more details on the specifics of that closer to the next trip. Q: This was the first year coral babies have been brought back to Georgia Aquarium. What have you learned about growing coral? Each species is very unique in what they need to survive as an adult and during the development period. That is what is so exciting about my job is that I’m constantly learning. We were all so excited to bring the corals babies back to the Aquarium. On average, we spent about 5-6 hours a week dedicated to the maintenance of the system they were living in, the feeding of the animals, and the documentation of the growth process. Q: What does the survival of the coral personally mean to you? Personally, this has been a very exciting winter working with this species. I’ve enjoyed being able to bring the coral babies back to the Aquarium in Atlanta to help educate guests. I have had the honor of working with coral reproduction now for seven years in the field, and bringing them back home to work with other biologists to show them how amazing these animals are, has been the best part. For more information about Georgia Aquarium coral research and conservation efforts, please visit www.georgiaaquarium.org/corals. To learn more about coral and its importance, visit Georgia Aquarium’s Tropical Diver exhibit. For updates on our 2017 coral spawning mission, follow us on Facebook, Twitter, and Instagram with #CoralSpawning2017.